On 12 February 2013, North Korean state media announced it had conducted an underground nuclear test, its third in seven years. A tremor that exhibited a nuclear bomb signature with an initial magnitude 4.9 (later revised to 5.1) was detected by the China Earthquake Networks Center, Preparatory Commission for the Comprehensive Nuclear-Test-Ban Treaty Organization and the United States Geological Survey. In response, Japan summoned an emergency United Nations meeting for 12 February and South Korea raised its military alert status. It is not known whether the explosion was nuclear or a conventional explosion designed to mimic a nuclear blast; as of two days after the blast, Chinese, Japanese, and South Korean investigators had failed to detect any radiation. On 12 February 2013, a spokesman for North Korea's army command said it had successfully conducted a third underground nuclear weapons test, according to the Yonhap. North Korea also said the test had used a miniaturized nuclear device with greater explosive power. Before North Korea announced they had conducted the test, seismic activity had already been detected in North Korea by the United States Geological Survey (USGS) and the seismic network operated by the Comprehensive Nuclear-Test-Ban Treaty Organization (CTBTO) Preparatory Commission, near the site of previous nuclear tests at Mantapsan in Kilju County. A large tremor, first estimated at magnitude of 4.9, was detected in North Korea, and governments in the region were trying to determine whether it was a third nuclear test. The USGS upgraded the magnitude of the possibly nuclear tremor from 4.9 to 5.1, located 24 kilometres (15 mi) east-northeast of Sungjibaegam, North Korea. The tremor occurred at 11:57am KST (2:57am UTC), and the USGS said the hypocenter of the event was only one kilometer deep. Later, the Geophysical Service of the Russian Academy of Sciences assures the residents in the Russian Far East that the nuclear blast did not trigger any seismic events and underground tremors at 16:00 local time on 12 February 2013 in the area and thus the North Korea's nuclear test does not pose danger to the residents there. The China Earthquake Networks Center (Abbreviation: CENC; Chinese: 中国地震台网中心) also reported this event, putting the magnitude at Ms 4.9. The tremor caused by the test could be felt by residents of the neighboring city of Hunchun and Antu, in Yanbian, Jilin Province, China. A citizen of Hyesan, Ryanggang Province of North Korea, 80 km (50 mi) west from the nuclear test site, reported that many 5- and 7-floor buildings shook very severely, and this caused cracking. The explosion was registered by 94 seismic stations and two infrasound stations in the CTBTO's global monitoring system. The CTBTO radionuclide network later made a significant detection of radioactive noble gases that could be attributed to the nuclear test. South Korea's defense ministry said the event reading indicated a blast of 6–7 kilotons, later revised to 6–9 kilotons using the Comprehensive Nuclear Test Ban Treaty Organization's calculation method. The Korea Institute of Geosciences and Mineral Resources estimated the yield as 7.7–7.8 kilotons while the Japanese put the estimation between 8 and 10 kilotons. Some experts estimate the yield to be up to 15 kilotons, since the test site's geology is not well understood. The Russian Defence Ministry said the power of North Korea's nuclear test blast "surpassed 7 kilotons". NORSAR compared the seismic data from all three North Korean nuclear tests and estimated the yield of the 2013 test as approximately 10 kilotons. The Federal Institute for Geosciences and Natural Resources, a state-run geology research institute in Germany, estimated the yield initially at 40 kilotons. However, this estimation has since been revised to 14 kilotons of TNT (59 TJ) after the January 2016 North Korean nuclear test was conducted. On 19 June 2013, the University of Science and Technology of China released a report that claimed that they had found the precise location of the test at latitude 41°17′26.88″, longitude 129°4′34.68″, with an error margin of 94 meters and the yield at around 12.2 kt, with a margin of error of 3.8 kt. In comparison, the fission nuclear bombs dropped by the Enola Gay on Hiroshima (Little Boy, a "gun-type" nuclear bomb) and on Nagasaki by Bockscar (Fat Man, an "implosion-type" nuclear bomb) had blast yield equivalences of 16 and 21 kilotons respectively. On 4 February 2013, a South Korean military official had stated that there was a "chance that the southern tunnel is a decoy, but we are not ruling out that the regime will conduct nuclear tests simultaneously at both tunnels". On 15 February 2013, North Korea had told China that they were preparing for one or two more nuclear tests that year. On 8 April 2013, South Korea had observed activity at Punggye-ri, suggesting that a fourth underground test was being prepared. It was later believed that the tunneling activity that started in April was for a long-term project, and that a nuclear test wouldn't occur soon. According to a U.S. expert, North Korea has everything in place for a fourth explosion but is hesitating due to the fear that it would anger China. A professor from Georgetown University predicted that test would occur in spring 2014 at latest. On 17 December 2013, a member of South Korea's parliamentary intelligence committee said that a nuclear and missile test would occur soon to draw attention away from the execution of Jang Sung-taek. This was said after North Korea floated propaganda leaflets to South Korea that threatened the annihilation of Baengnyeongdo. On 22 April 2014, South Korea reported that North Korea had stepped up its activity at its main nuclear test site, meaning they may be preparing for their fourth underground nuclear test. The United States urged North Korea to refrain from testing. On January 6th, 2016 North Korea says it has successfully carried out a hydrogen bomb test, which if confirmed, will be a first for the reclusive regime and a significant advancement for its military ambitions. The test took place at 10 a.m. local time, the regime said in a televised statement. The seismic event, which measured the event at a magnitude of 5.1, occurred 19 kilometers (12 miles) east-northeast of Sungjibaegam, the United States Geological Survey said. A senior U.S. administration told CNN it could take days to obtain the scientific data to determine whether this was a successful test. In response, Japan's Prime Minister, Shinzo Abe, called an urgent security meeting of the United Nations Security Council. The emergency session was to be held 9 AM EST on 12 February 2013. Tibor Toth, executive secretary of the Comprehensive Nuclear-Test-Ban Treaty Organization Preparatory Commission (CTBTO), confirmed the event's location was "roughly congruent with" nuclear tests carried out by North Korea in 2006 and 2009. Japan's Kyodo News service reported the Japanese defense ministry had scrambled aircraft to hunt for radiation effects. Japan's government held a national security council meeting in Tokyo according to NHK. The South Korean military also raised its readiness level. In general, international reactions to the 2013 North Korean nuclear test have been almost uniformly negative. ^ a b c "M5.1 Nuclear Explosion - 24km ENE of Sungjibaegam, North Korea". Earthquake Hazards Program. United States Geological Survey. 12 February 2013. Archived from the original on 13 February 2013. Retrieved 12 February 2013. ^ a b c "How Powerful Was N.Korea's Nuke Test?". The Chosun Ilbo. 14 February 2013. Archived from the original on 17 February 2013. Retrieved 17 February 2013. ^ a b "Chinese underground nuclear test North Korea reached an unprecedented precision measurement". 19 June 2013. Archived from the original on 21 October 2013. Retrieved 14 July 2013. ^ a b c "Russia says no danger to Far East residents over North Korea's nuclear test". Archived from the original on 5 March 2016. Retrieved 23 October 2016. ^ "North Korea's Punggye-ri Nuclear Test Site: Analysis Reveals Its Potential for Additional Testing with Significantly Higher Yields". 38North. 10 March 2017. ^ a b "朝鲜(疑爆)Ms4.9地震" (in Chinese). Archived from the original on 9 August 2014. ^ "Press Release: On the CTBTO's detection in North Korea". CTBTO. Archived from the original on 15 February 2013. Retrieved 12 February 2013. ^ Broad, William, "A Secretive Country Gives Experts Few Clues to Judge Its Nuclear Program", New York Times, 12 February 2013. "As is usual with tests by the secretive North, it was not even clear if the underground test was nuclear, rather than conventional bomb blasts meant to mimic an underground nuclear test;"
^ "BBC News - North Korea nuclear test: No radiation detected". bbc.co.uk. 14 February 2013. Archived from the original on 30 March 2013. Retrieved 16 April 2013. ^ "(URGENT) N. Korea confirms it conducted third nuclear test". YonHapNews. 12 February 2013. Archived from the original on 15 February 2013. Retrieved 12 February 2013. ^ "North Korea Nuclear Threat". 5 March 2013. Archived from the original on 11 April 2013. Retrieved 26 March 2013. ^ "N.Korea says test used miniaturised nuclear device with greater explosive force". Voice of Russia. 12 February 2013. Archived from the original on 17 February 2013. Retrieved 12 February 2013. ^ a b "M5.1 – 24km ENE of Sungjibaegam, North Korea". USGS. 12 February 2013. Archived from the original on 13 February 2013. Retrieved 12 February 2013. ^ "吉林珲春市民感到晃动 老太错以为心脏病犯了_资讯频道_凤凰网". IFENG. 12 February 2013. Archived from the original on 16 February 2013. Retrieved 12 February 2013. ^ "Hyesan Suffers Test Quake Damage". Daily NK. 13 February 2013. Archived from the original on 18 February 2013. Retrieved 14 February 2013. ^ "Update on CTBTO findings related to the announced nuclear test by North Korea". CTBTO. 15 February 2013. Archived from the original on 21 March 2015. Retrieved 14 April 2015. ^ "CTBTO detects radioactivity consistent with 12 February announced North Korean nuclear test". CTBTO. 23 April 2013. Archived from the original on 28 April 2015. Retrieved 14 April 2015. ^ "Gases "consistent with" North Korea's February test found: nuclear body". Reuters. 23 April 2013. Archived from the original on 14 April 2015. Retrieved 14 April 2015. ^ Riviera, Gloria; Akiko, Fujita (12 February 2013). "North Korea Tremor Arouses Suspicion of Nuclear Test". ABC News. Archived from the original on 13 February 2013. Retrieved 12 February 2013. ^ Chance, David; Kim, Jack (12 February 2013). "China joins U.S., Japan in condemning North Korea nuclear test". Reuters. Archived from the original on 12 February 2013. Retrieved 12 February 2013. ^ MacLeod, Calum (12 February 2013). "Obama calls North Korea nuclear test a threat to U.S." USA Today. Archived from the original on 12 February 2013. Retrieved 12 February 2013. ^ a b c Choi He-suk (14 February 2013). "Estimates differ on size of N.K. blast". The Korea Herald. Archived from the original on 16 February 2013. Retrieved 17 February 2013. 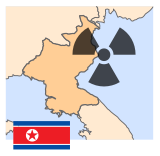 ^ "North Korea nuclear test raises uranium concerns". BBC News. 12 February 2013. Archived from the original on 15 February 2013. Retrieved 12 February 2013. ^ "Пхеньян устроил "безупречный" взрыв". Interfax. 12 February 2013. Retrieved 14 March 2014. ^ Rozin, Igor (13 February 2013). "Russia condemns North Korea's new nuclear test". Retrieved 23 October 2016. ^ "Nuclear explosion in North Korea, February 12, 2013". NORSAR. 12 February 2013. Archived from the original on 22 February 2013. Retrieved 13 February 2013. ^ "Nuke test air samples are a bust". 15 February 2013. Archived from the original on 23 May 2013. Retrieved 16 February 2013. ^ Ryall, Julian (4 February 2013). "North Korea 'preparing for two nuclear tests'". London: Telegraph. Retrieved 16 April 2013. ^ Kang, Benjamin (15 February 2013). "Exclusive: North Korea tells China of preparations for fresh nuclear test - source". Reuters. Retrieved 16 April 2013. ^ "Activity at North's nuke test site-INSIDE Korea JoongAng Daily". Koreajoongangdaily.joinsmsn.com. 8 April 2013. Archived from the original on 17 April 2013. Retrieved 16 April 2013. ^ 38 North (25 June 2013). "New Tunneling Activity at the North Korean Nuclear Test Site". 38 North. Archived from the original on 1 July 2013. Retrieved 26 June 2013. ^ Dahl, Fredrik (17 July 2013). Pfeiffer, Tom (ed.). "North Korea has everything in place for new atom test: U.S. expert". NBC News. Retrieved 18 July 2013. ^ Yonhap News Agency (13 November 2013). "N. Korea could conduct 4th nuclear test late this year: US expert". GlobalPost. Archived from the original on 2 December 2013. Retrieved 16 November 2013. ^ David Stout (17 December 2013). "South Korean Official: The North is Preparing for Another Nuclear Test". TIME. Archived from the original on 21 December 2013. Retrieved 17 December 2013. ^ Jethro Mullen; Stella Kim (22 April 2014). "North Korea steps up activity at its nuclear site, South says". CNN. Retrieved 22 April 2014. ^ "U.S. urges North Korea to refrain from new nuclear test". 22 April 2017. Retrieved 23 October 2016 – via Reuters. ^ CNN, Euan McKirdy. "North Korea says it has conducted hydrogen bomb test". Archived from the original on 22 October 2016. Retrieved 23 October 2016. ^ "M 5.1 Nuclear Explosion - 21km ENE of Sungjibaegam, North Korea". Archived from the original on 7 January 2016. Retrieved 23 October 2016. ^ "Quake triggers doubts about North Korean nuclear test". Rediff News. Retrieved 12 February 2013. ^ "N.Korea seismic event shows 'explosion-like characteristics' -CTBTO". Trust.org. Archived from the original on 16 April 2013. Retrieved 12 February 2013. ^ "'Artificial Earthquake' Suggests North Korea Just Tested a Nuclear Bomb". Atlantic Wire. Archived from the original on 13 February 2013. Retrieved 12 February 2013. ^ Seig, Linda (11 February 2013). "Japan holding security meeting after N.Korea nuclear test report: NHK". Reuters. Archived from the original on 13 February 2013. Retrieved 12 February 2013. ^ Song Sang-ho (12 February 2013). "N.K. has conducted 3rd nuke test". The Korea Herald. Archived from the original on 12 February 2013. Retrieved 12 February 2013. ^ Chance, David (13 February 2012). "North Korean nuclear test draws anger, including from China". Reuters.com. Retrieved 13 February 2013. This page was last edited on 20 June 2018, at 16:08 (UTC).